Fight for wages We can live on! 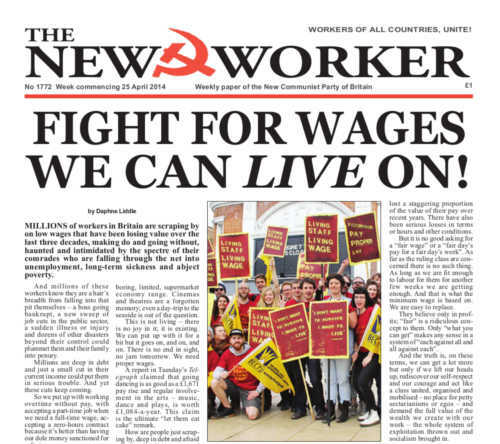 MILLIONS of workers in Britain are scraping by on low wages that have been losing value over the last three decades, making do and going without, haunted and intimidated by the spectre of their comrades who are falling through the net into unemployment, long-term sickness and abject poverty. Tension is rising in Ukraine as the puppet regime orders its troops to resume operations against the anti-fascist movements that have taken control of large parts of the south and east of the country. Last week’s peace agreement is in tatters and Russia has warned that any attack on Russian citizens would be an attack on the Russian Federation. The Russians say the Kiev authorities must “immediately” deescalate the situation in southeast Ukraine by withdrawing its troops from the region, start nationwide talks and stop “distorting” the Geneva agreement. TRADITIONALLY the most important date in the Christian calendar is reserved for the usual homilies about Jesus of Nazareth from Church leaders and the platitudes from those who claim to lead us, right across the bourgeois political spectrum.